There is something about playing baseball that lights up a youngster’s eyes. Sadly, for children with physical or mental challenges, that opportunity can often be a difficult or impossible experience. The Miracle League of Montgomery County (a 501(c)(3) not-for-profit organization) was formed by the Kiwanis Club of Bethesda to give these children the opportunity to play baseball as a team member in an organized league. The Miracle League gives ALL children the opportunity to get out in the sunshine, and enjoy playing the game of baseball in its purest form. It is the first of its kind in Maryland and serves children in Montgomery County, the surrounding counties, DC, and Virginia. Promote community support and sponsorship of a Miracle League. Promote the construction of special facilities that meet the unique needs of Miracle League players and families. 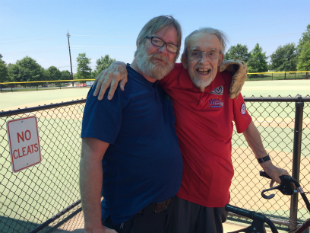 The Washington Nationals Miracle Field was built in 2012 with funding through the Bethesda Kiwanis Club, a sizable bequest from Sid and Roxie Hayes and a very generous donation by the Lerner family, owners of the Washington Nationals. The field is located in Germantown, Maryland in the South Germantown Recreational Park off of Schaeffer Road, directly across from the soccer complex. The field is a specially equipped baseball field designed to be accessible by disabled children, providing mentally or physically challenged children the recreation opportunity they deserve. During Miracle League games, each child will have a chance at bat and to score a run. Miracle League team members are assigned buddies who assist them in hitting the ball and “running” the bases. Fellow schoolmates, members of Kiwanis Key Clubs, college students, business leaders or anyone who wishes to volunteer their time, will be enlisted as buddies to give each child the gift of baseball. We are always recruiting coaches, buddies, and other team supporters. For more information please email mlmcbb@gmail.com.